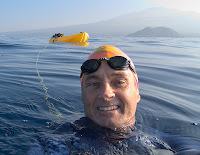 I resumed swimming out in the deep water this morning, once again towing my teeny-tiny little kayak behind me. 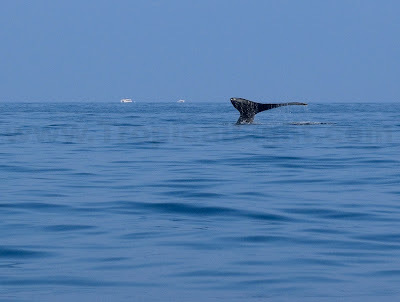 I could hear the Humpback Whales singing loudly, which meant they were quite close, but I never saw one the entire swim. When I finally got tired and climbed into my kayak, there they were, all around me. It is amazing how little you can see while swimming. 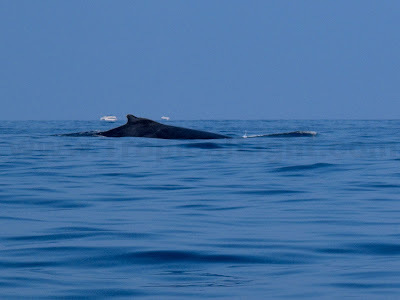 Especially around whales - they are masters at blending in. OMG!!!! of course! they recognize the kayak!LOL they probably think youve been floating out there all year! Beautiful shot of that fluke!